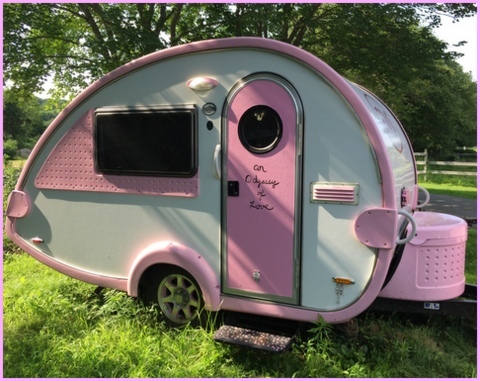 My husband and I dream of owning a camper, someday driving across the USA. Recently, I met a special glamper and “Sisters on the Fly” member who did just that with her husband. Now, she’s traveling alone, on a special mission, carrying on her husband’s legacy of love. 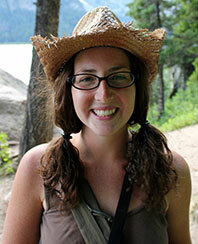 We mentioned Alison Miller in the Aug/Sept issue of MaryJanesFarm in our “Camp Like a Girl” article. (If you don’t have a subscription to MaryJanesFarm, subscribe here.) 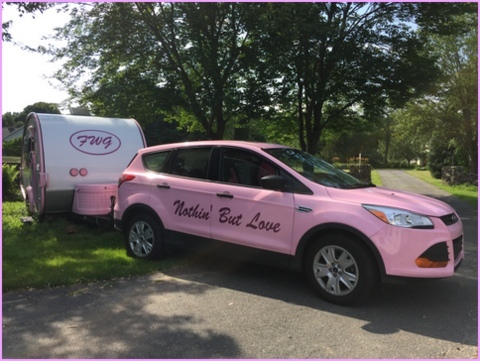 I first noticed Alison in a Facebook group, “Glampers on the Loose.” There, I’d dream, admiring glampers, but it was a post by Alison, the spunky, beautiful blonde driving a pink tab trailer and matching car, that moved me to tears. Ever watch a movie or read a book like Nicholas Sparks’ The Notebook, and wonder if life is ever really that romantic? A few moments with Alison and her love story, and you know it is. Born in Ft. 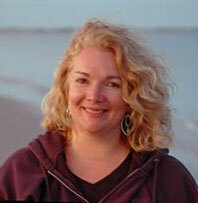 Hood, Texas, Alison’s family moved around, settling in New Jersey, where she graduated from high school. Alison first met “Handsome Husband” Chuck Dearing as a recently-divorced, single mom with three small children and living with her mother. Chuck, a neighbor, knocked on the door looking for a parttime babysitter for his young daughter. Alison remembers answering the door in her “ugly, government-issue glasses” and butterflies in her stomach. A friendship grew between Alison and Chuck, but her mom could see the sparks between the two. Always thoughtful, Chuck once got friends at work at McGuire Air Force Base to pitch in for groceries for Alison and her children, putting the rest of the money into a signed card. Love grew, and they married, raising their brood of four together. 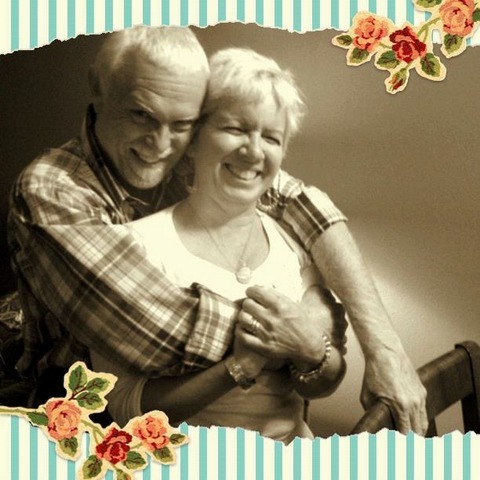 Their 24-year marriage was a fairy tale; they were very much in love. Photos show them staring into each others’ eyes, laughing, kissing, dancing. 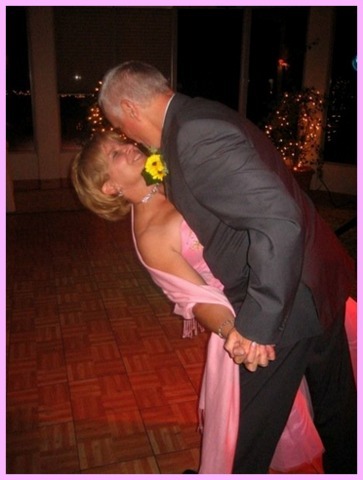 Whenever they’d dance, Chuck always dipped his sweetheart at the end, making Alison weak in the knees. Instead of automatically answering “I love you, too,” they validated each others’ adoration with “I feel loved.” Alison and Chuck truly cherished one another. Chuck was incredibly romantic, and they loved romantic movies. Their favorite was “PS, I Love You”. Chuck also loved traveling. After he retired from the Air Force, the couple decided to sell everything and travel. (They traveled, not camped. 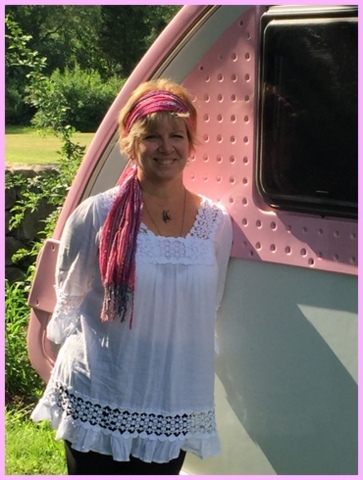 Alison insists she’s not a “camper.”) Chuck was the planner, the route-mapper and adventurer; his wife happily went wherever he wanted, always feeling safe and protected by her husband’s side. While visiting their daughter in Oregon in 2010, Alison had a friend in New Jersey who was losing her battle with cancer. Chuck bought his wife a ticket to see her friend. Dropping Alison at the airport, he noticed a BB-sized lump under his wrist, which grew bigger in three weeks. Back in New Jersey to join Alison, he visited their doctor. Chuck had an aggressive form of cancer. Treated with five surgeries and massive radiation, he seemed okay with his odds, which looked good. In between doctor appointments, they traveled. While in Florida, Chuck made the decision for no more CAT scans. They’d danced their last dance under the stars in Death Valley. 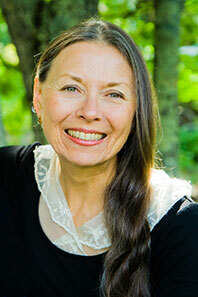 Her love passed at age 60, with Alison and their children at his side. Chuck and Alison kept a journal together…leaving each other treasured love notes. Her son Nick, a firefighter in my town of Newtown, CT, texted Alison a song he thought she should sing at the funeral: “I’ll Love You to the End.” He didn’t know then it was the song from the movie “PS, I Love You.” At the service, Nick played guitar and Alison sang with a confidence she didn’t know she had. 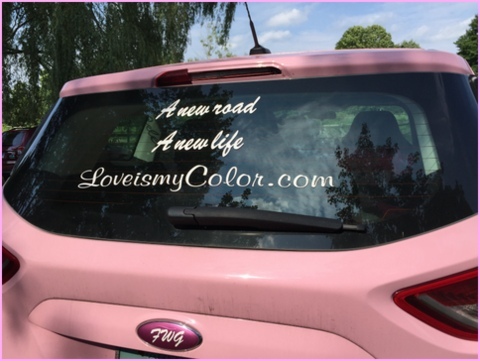 Alison had told Chuck she’d continue traveling, painting her car pink so he could find her. He’d replied, “I’ll be looking for you.” He requested she return to four places they’d visited to scatter his cremains: Crater Lake, Oregon; Dry Tortugas in the Florida Keys; Chief Crazy Horse Carving, South Dakota; and Little Big Horn, Montana. 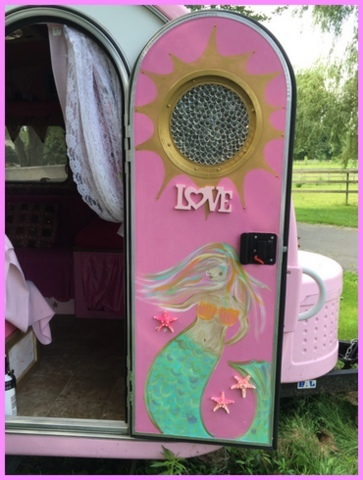 Alison’s daughter freehand painted the inside door. One of the “Sisters on the Fly” made the pennant. The cabinets over her bed are adorned with photos of her beloved. In true farmgirl fashion, Alison glamped-up the inside. The walls are done up in fabric with fancy duct tape. Alison has been through so much, but she’s brave and strong, stronger than she even realizes. 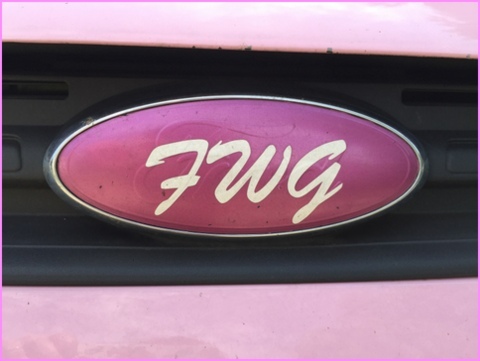 The “FWG” stands for “F***ing Warrior Goddess”. My daughter and I really connected with Alison. She dubbed me a “Fierce Warrior Goddess” and Audrey “Future Warrior Goddess”. If she hadn’t traveled with Chuck for four years, Alison wouldn’t be doing what she’s doing now. On a mission to honor his legacy, Alison’s been on the road over two years so far. 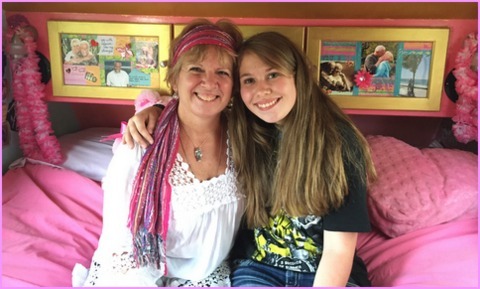 Each of their kids have joined her for a time on her “Odyssey of Love.” She doesn’t use a map, and remembers Chuck saying, “Whenever you’re lost and you think to go one direction, take the other.” The pink, a color of strength and joy, draws people. Once, a complete stranger approached, saying, “Chuck wants you to know he’d never leave you without a road map.” She’s met people everywhere, and feels the entire country is cheering her on. If you’re lucky enough to meet Alison on her journey, you’ll feel the love. It radiates from within her. 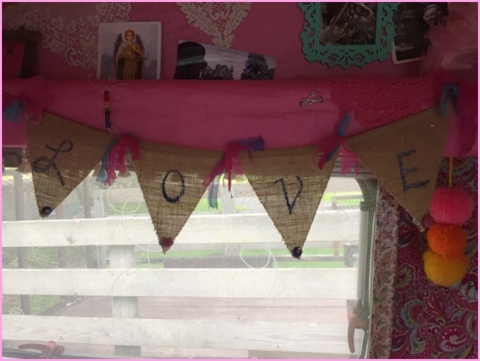 With all the craziness going on in the world, Alison’s message is truly “nothin’ but love.” I believe there are angels among us … and I think Alison is one of them. *Alison is collecting wedding photos and love stories after finding some old wedding photos in an antique store. If you’d like to share yours with her, send them to: odysseyinpink@gmail.com. Wonderful, wonderful post! 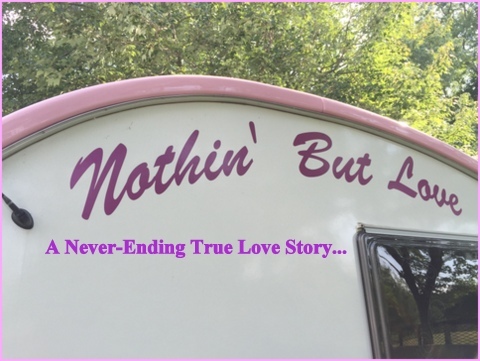 I certainly felt ‘nothin’ but love’ reading this. Thank you, Nicole (and Alison) for sharing this. I know exactly how you feel…ALL you hAve is the memories. Rest in Peace sweetheart…. 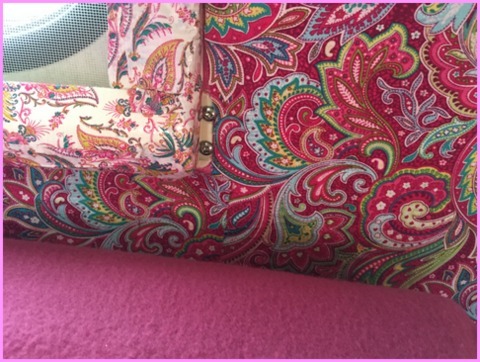 i love it..what a beautiful article, alison…you inspire me, as you always have. This is beyond beautiful…..Thank you for sharing! Bless you! Blessings sweet lady on your journey of Love. I’ve been following Allison for a long time, loving every minute of it but thanks to you Nicole, I feel like I know her better now. Wonderful post. Love her story, keep on doing what makes you happy! Alison is a remarkable woman and I hope you can fulfill your dream. 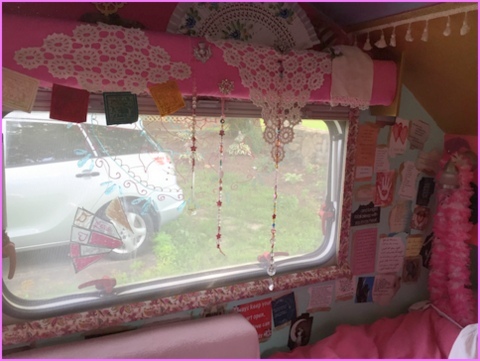 For five years, I traveled in an 18′ motorhome named Wendy (because Wendy went everywhere with Peter Pan and I was Peter Pan) and for two years in a 27′ motorhome named Lucy (because even though she was a pain at times, everyone loves Lucy). There is nothing like traveling where you want to do what you like and then coming “home” to enjoy your life. I also hope Alison has many happy years on the road. Thanks for the feelings of LOVE in a tough situation. This is a true story of LOVE and we for sure need all the LOVE we can find. I so hope that Alison does find her way to my neck of the woods because it is beautiful here and because it would be so wonderful to meet her. Best wishes Alison!! and thank you Nicole for your LOVE. God bless. This story made me cry. Allison is so pretty and I love her pictures and her “glamper” with the car in pink! Very sweet story of true love. I have my own with Richard. Audrey looked so mature in her picture that I did not recognize her at first. I thought “what a pretty girl” and it was my granddaughter! Hi Mom, Yes, Alison’s story made both Audrey and I cry. She’s an amazing woman, and an inspiration. I feel blessed to have spent time with her. Thank you for your truly heartfelt, inspiring story. She faces her pain and loss with faith and courage. A lesson for us all to learn. Lessings her way, and safe travels always! One of the things that is so fascinating to me when I see my story written by someone other than I, is the perceptions by those who read it. I do know that Chuck knew that I was/am a strong woman, and he knew I’d do something with this experience. And it helps me to hear other’s perceptions at a time when I don’t really trust my own, so thank you for your words. Oh my goodness, how special is that?!?! thank you for sharing that and thank her for doing that amazing journey she is on! what a story! I apprectiate that you took the time to read the story of my Odyssey. Nicole did a great job with interviewing me (and I loved that her daughter was with her), and a great job writing about it. This was such a special post to read. I bet it was even more special to write. You know what my favorite part was? The journal they kept together. That is absolutely amazing. Every married couple should do that. I’m so glad you had the opportunity to meet Alison… and to introduce her to us! Hi Dori! Our time with Alison was so special. I am so glad to have met her. My husband got to meet her, too, as we had her over for dinner after I interviewed her for the blog. 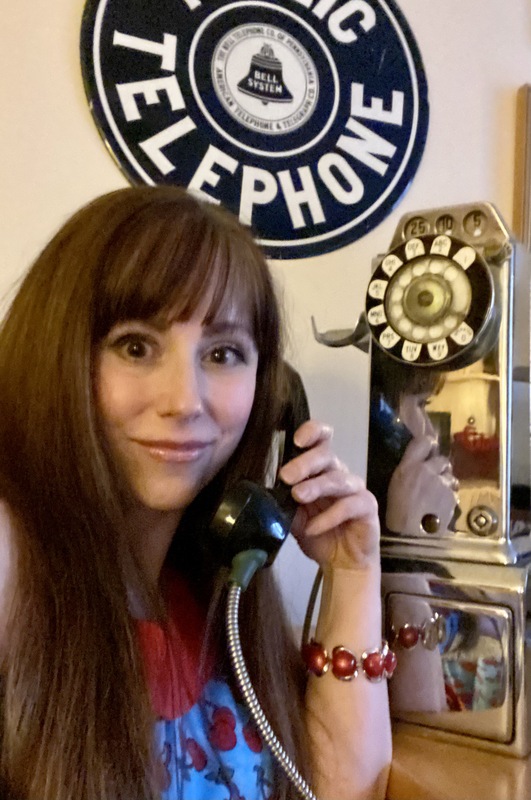 She is now a dear friend, and Audrey really connected to her, too. I LOVED the journal, too. Isn’t that a great idea? 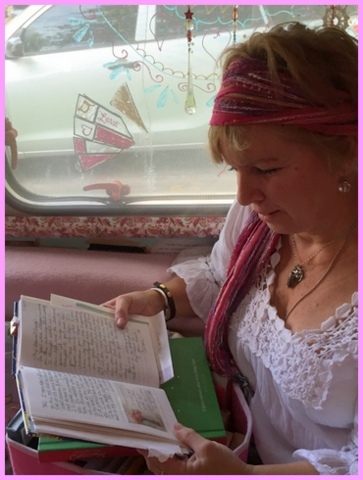 What a fabulous wedding gift to give…a nice blank journal! I love the look on Alison’s face as she was reading it. 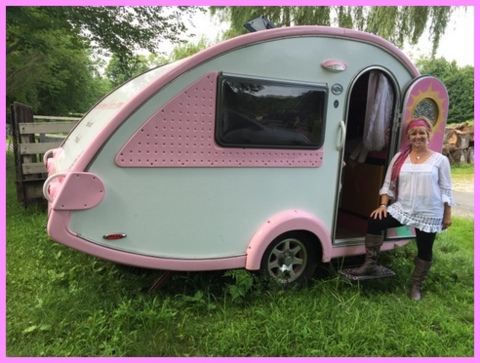 dammit, you made me cry at work….very moving I will be looking for that pink teardrop on my travels. How do you travel? In a trailer? I’d never even thought about trailers until I got my own, and now I’m fascinated with all the kifferent kinds that I see out on the road and at SOTF campouts. What an awesome story!! Love her car and trailer. You go girl!!! Hope our paths cross sometime. Take Care and a beautiful love story!! Thank you for your words. It was such a treat to meet Nicole and be interviewed by her; it gives me an opportunity to touch base with so many more people along the way. What a beautiful, loving story. Loved every word and was sorry when it was to the end. I think there is some ‘nomad’ in me also….currently keeping my eye out for an small, older trailer that I can ‘doll’ up. How can I follow Allison to read about her adventures? Thank you for the great post. Nicole, what a beautifully written story. It proves, without a doubt, that even though a loved one is gone, love never ends. Alison, on your way to Moscow, Id to visit Mary Jane, please stop by Fairfield, WA. 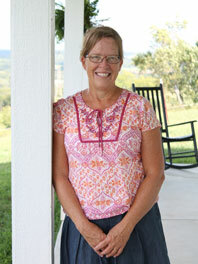 It’s beautiful here and I have lots of farm girlfriends that would love to share stories with you! Love your story,happy trails sister and if ever in the Ozarks your welcome to my little nest on the river. All I can muster is “WOW”. What a touching story. Thanks for sharing it with us. Makes me feel hopeful and thankful all at the same time . Wow, Nicole, this is so beautiful to read. Alison is certainly courageous. I love her living legacy. Very inspiring. And how wonderful for you and Audrey to meet her. Oh what an amazing story! 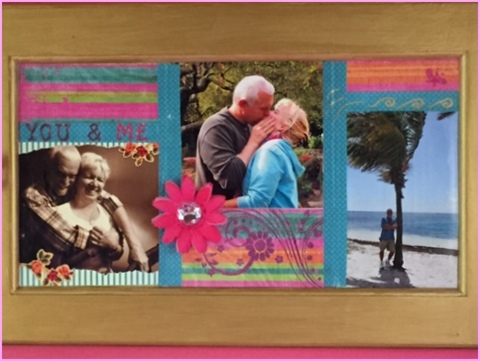 Thank you for sharing Alison’s story (love her decorating too). Also, best wishes to Paige Bridges (Aug 5 comment).